What if I told you that I caught a glimpse of a beauty secret revealed on Snapchat? Would you pay attention? How about I raise the stakes by saying that this beauty product was recommended by a celebrity known for his ageless visage. You're in for a treat because, while I was mindlessly browsing snapchat, I stumbled on a pic where a reveal was so good that I had to quickly capture it. What made this snapshot so valuable is that it was a recommendation made by baby faced superstar, Pharrell Williams. What's even more exciting is this isn't some ultra expensive high end product. In fact, it's from a brand that we should all be familiar with by now. You may remember that I recently fell in love with Glytone after trying their gel facial wash. My skin adores this stuff. In fact, I was so smitten that I wanted to pick up something else from their line. 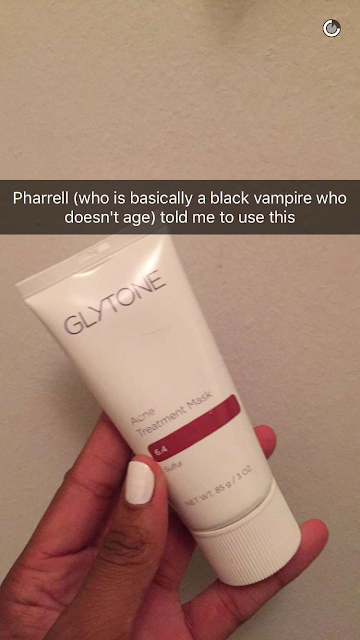 The item featured in the snap screen shot is Glytone's Acne Treatment Mask. It's an intense sulfur mask that helps control oil and cleanse clogged pores. You use it like any other mask, meaning the product is left on for 20-25 minutes before rinsing off. I like the fact that bentonite is the primary ingredient which means that it can draw out impurities before treating the skin with sulfur. Back in my troubled skin days I would have loved a product like this because salycilic acid was not cutting it. But if you're a fan of traditional acne spot treatments, you can still use this treatment first then follow up with a topical medication. You don't have to look far because Glytone also has an acne treatment lotion and cleanser that reviews seem to love. It always makes me wonder whenever I hear about people with perfectly clear skin using acne fighting products. Is this part of their strategy to "staying ready?" Perhaps it's a way of staving off random unexpected breakouts. We all know that celebrities have to be camera ready at all times. That's why their dermatologists recommend products like Glytone to keep their skin flawless. Wow! Nadege, this is an interesting read. Yes, Pharrell has really nice skin and I will have to try out this product. It sounds great. I read your article .I think it's helpful for me and others. Hi Mumbi. It's Shiona Turini's Snapchat. Clear skin Max is actually a 5-step program that cleanses and purifies skin. It also clears the pores, which are the breeding ground for acne causing bacteria.